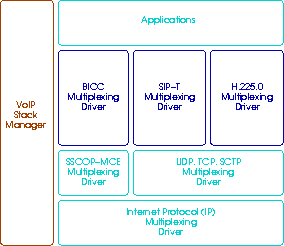 Description: OpenSS7 Project Status VoIP Stack. These projects are for components of the OpenSS7 VoIP stack. Each component is tracked under a separate project. Click on any of the components below to see project information relating to the desired component. This project provides a Session Initiation Protocol (SIP) driver for ISUP Transport and tandem under the Call Control Interface (CCI). This project provides an H.323, H.225.0/245 driver that provides the Call Control Interface (CCI). The VoIP Stack Manager is a project to provide configuration and management tools for the OpenSS7 VoIP stack.